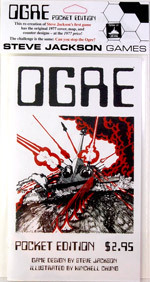 Daily Illuminator: Free Ogre Pocket Edition! December 6, 2013: Free Ogre Pocket Edition! If you're an Ogre Kickstarter backer and you purchase $50 or more of Ogre extras on W23 between December 6th and 8th, you'll get a free Ogre Pocket Edition! Qualifying products are on this page. Anyone else can get a free Ogre Pocket Edition by buying $150 or more of merchandise on W23! Go get yours!